Mt. Carmel Center (Daily Mail, May 17, 2017). Click to enlarge. At the beginning of this story, in February of 1993, David Koresh lived in and led a small religious community of people called Branch Davidians. David Koresh had been born Vernon Wayne Howell, but legally changed his name before this story begins. The Branch Davidians had lived in Waco for decades, having split off from the Seventh Day Adventist Church years before. The men, women, and children that made up the group lived in a communal plywood house they had built themselves. The Branch Davidians called their rambling frame home the Mt. Carmel Center. It was situated on 77 acres of slightly elevated farmland, in a vast sea of flat prairie. There were few trees. From the windows of their home, the Branch Davidians could see out for miles, far out over the surrounding grasslands. 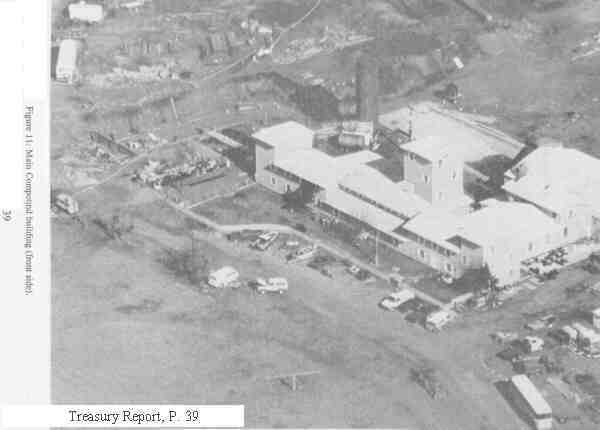 The Treasury Report contains a number of aerial photos and diagrams of the Mt. Carmel Center. One such photo is on display in Treasury Report, pg. 17. Note the four story residential tower in the center of the building. The Mt. Carmel Center was a complex of buildings that the milatrists and news media took care to call a "compound," as though it were built in anticipation of military attack. It included a gym, a swimming pool, a chapel, a communal kitchen, a water tower, a buried school bus intended for use as a tornado shelter, and a larger more permanent tornado shelter that was under construction. It also included a large two-story residential section with many rooms. the women and children resided on the second floor, according to the diagrams used by the assault teams. The men resided on the on the first floor. At either end of the building was a three-story tower. Behind the building was a four-story tower. The base of the four story tower consisted of a room made of 6-inch steel-reinforced concrete. That concrete room had originally been build as a storage vault as part of an earlier structure on the property. The concrete room measured 19 feet deep by 20 feet long (as described by Texas Ranger Sgt. Raymond Coffman in his testimony at the 1994 San Antonio trial of the Branch Davidians (Transcript pg. 957); it had no windows and one doorway. In recent years the door to the concrete room had been removed, so the area formed a cul-de-sac. As our story begins, the concrete room served as a food storage area, or pantry. A walk-in refrigerator had been installed at one end within that area, measuring 8 feet by 4 feet. 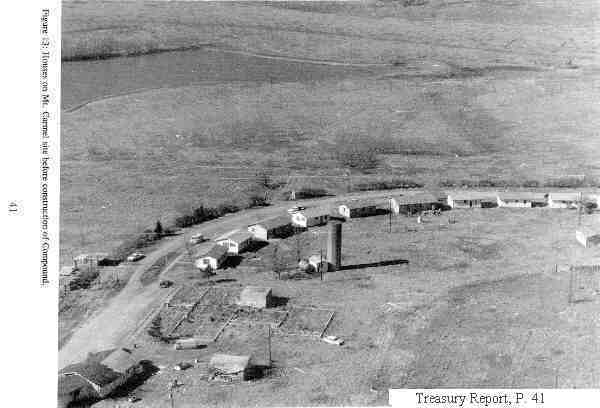 This concrete room can be clearly seen in an aerial photograph in the Treasury Report, pg. 41, taken of the property before the structure in Figure 17 was built. The concrete room appears just below and to the left of the water tower. The Figure 18 photograph appears in the Treasury Report on pg. 41, but the caption underneath does not tell when the photo was taken, by whom, for what purpose, or how it came into the hands of the US Treasury Department. The Branch Davidians, like many Americans who live with the threat of tornadoes, buried an old school bus on their property to provide a makeshift shelter from the storms. The school bus was reached through an underground tunnel accessible through a trap door inside the building, on the first floor of one of the three story residential tower. In the upcoming exhibits, we will critically discuss a sketch of the Mt. Carmel Center US News & World Report, May 3, 1993; this figure shows the relationship of the concrete room ("cinderblock room") to the other building elements. 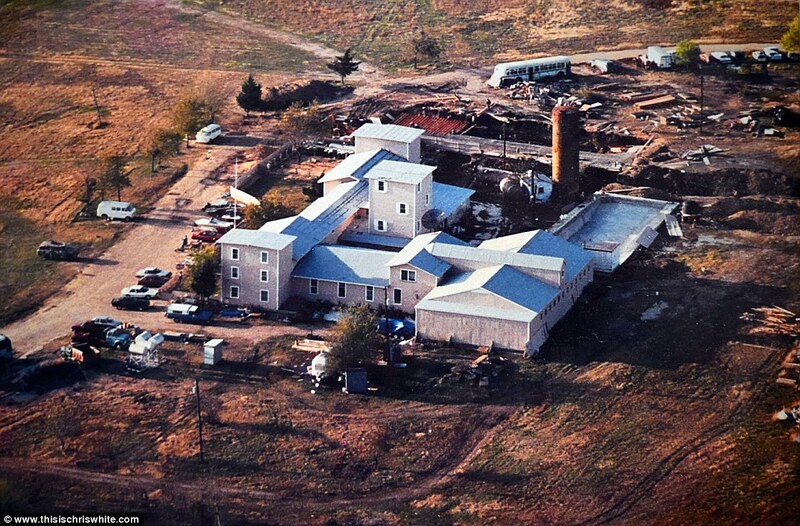 In 1993 the Branch Davidians were constructing a more substantial underground tornado shelter. Part of it had been completed and roofed. Another section was still under construction. The underground tunnel from the house to the school bus continued on and connected to the new tornado shelter. The importance of the concrete room and some of the other architectural elements in the Mt. Carmel Center will become clear as our story unfolds. The Treasury Report contains a number of diagrams of the Mt. Carmel Center. The text says these diagrams were based on the memory of an ATF informant, David Block, whom the Treasury Report identifies as a "former cult member." These diagrams are shown in Dumb Diagrams of the Mt. Carmel Center (from Treasury Report, pgs. 47-49). Note that the concrete room is adjacent to the dining room and kitchen, and is labeled "dry food," "ref.," and "food storage." The "men's quarters" are clearly marked. These Dumb Diagrams do not include the buried school bus/tornado shelter, nor the new tornado shelter uncer construction. By inference, the reader of the Treasury Report might assume that these were the diagrams used to plan the raid. Such an assumption would not be correct. The Treasury Report does not contain the diagrams used by the ATF (soldiers) while planning and executing the raid. Those real working diagrams are shown in Smart Diagrams of the Mt. Carmel Center. Those diagrams were left in a Waco diner by ATF agents. A waitress found the diagrams as she was cleaning the counter and passed them along to Waco researcher Ken Fawcett, who passed them on to the Museum. We may know that the Smart Diagrams are authentic and were used by the DOD/FBI/ATF during the Waco operation because the left hand portion of Smart Diagram of Mt. Carmel, first floor, was used to record the locations of the recovered bodies. They form a part of the official record of the office of the Justice of the Peace, Precinct 2, McLennan County, from which the official records were acquired by the Museum. The body recovery map may be seen at Remains Recovered from Mt. Carmel: Exterior Grounds. Note the shape of the buried school bus and the tunnels, and the positioning of the labels. The size of the type on the Smart Diagrams indicates that these diagrams must have been quite large in the original, and were reduced for the convenience of the agents who carried them. Compare these two sets of diagrams: the Dumb and the Smart. Note that an entire section of the building is omitted from the Dumb Diagrams — the area behind the stage that apparently contained a photo lab, a lathe, and an area set aside for "chemical storage." The Smart Diagrams show the relationship of the house, the tunnels, the buried school bus, the new tornado shelter, and the tornado shelter that was under construction. Names of various Davidians have been written on the diagram, apparently to indicate their bedrooms or working space. The men's quarters on the first floor are clearly marked, as are the second story living quarters of the women and children. Quite obviously, the Smart Diagrams, with their careful details, were sketched by professionals with deep and first-hand knowledge of the layout and the living arrangements of the Branch Davidians. Why were the Smart Diagrams left out of the Treasury Report, and why were the Dumb ones included? Quite possibly because the Treasury Report sanitized the original assault in which the women and children's quarters were straffed by machine guns from helicopters and riddled by snipers from the ground. The Mt. Carmel Center was also an FCC licensed ham radio station. A magazine that caters to ham radio buffs, QST Magazine (June, 1993, pg. 78), says Branch Davidian Wayne Martin had talked about the existence of a ham radio tower at Mt. Carmel with another amateur operator in Waco before the raid. The tower was an inverted "V" 14 megahertz, wire dipole antenna with which Martin claimed to have made contact with other operators around the world. The existence of the ham radio station was admitted by the FBI in an interview with Associated Press printed in the Atlanta Journal on March 5, 1993. A letter from the FBI to Rep. Newt Gingrich (R-Ga.), April 5, 1994 (see page 1 and page 2 of that letter), reveals that "[t]he Branch Davidians had the means to send and receive communications, and the FBI took steps to deny those communications …"
Mr. George Zimmerlee of Marietta, Georgia, himself an electronics engineer and ham radio operator, has made a study of photos of Mt. Carmel Center before the raid. "The tower was apparently pulled up by a government operative even before helicopter gunships began firing into Mt. Carmel." In the above-cited letter to Rep. Newt Gingrich on April 21, 1994, the FBI admitted that "The Branch Davidians had the means to send and receive communications, and the FBI took steps to deny those communications …" Mr. Zimmerlee says his conclusion is that the raid on Mt. Carmel was a military operation, not a search.